I got a rubber-banded packet of mail yesterday, as if the post office was saving it all up in order to deliver it all in one go! 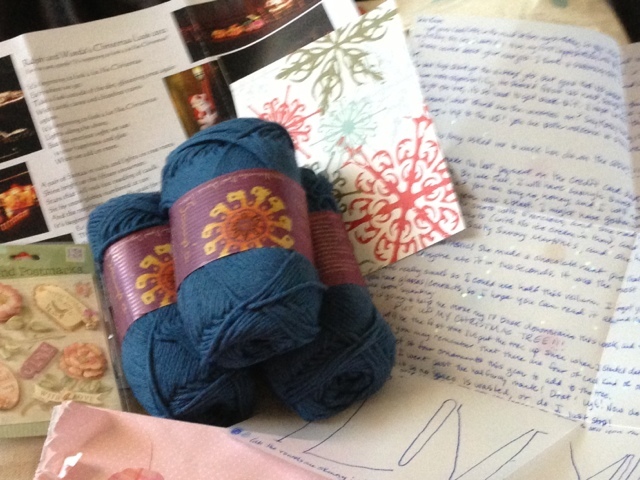 There were lots of lovely goodies: a Christmas card from Jocky, a gorgeous, sparkly vellum letter from Mama with card-making stickers, a funny photo letter from Ralph and Wanda, and some organic cotton yarn from Jody! Today, I got Sarah and Brian's annual family newsletter and a card from Aunt Chris. Love it! Yay! Sorry the card was late. Hopefully the gift won't be too much later.